Are you the sort of person who relies on your friends to help you figure out the best places to explore on the web? Wish you could lean on your friends to get insights into the great new services you ought to try? That's the idea behind HypeMarks (www.hypemarks.com), a new startup looking to tap into your social graph to guide you to the web. We thought we'd get the pitch from Tim Sae Koo, the founder of the company, on how he took the idea from his business class at USC and turned it into a company, which is now part of one of the local startup accelerators in town, StartEngine. What is HypeMarks all about? Tim Sae Koo: What we try to do, is help you and your friends discover the web, through each other. We help you turn you and your friends into personal tour guides to the web, ultimately making it easier to find new and awesome sites through each other. Tim Sae Koo: I came up with the idea about a year ago, when I was in college., I'm a person that loves discovering new stuff on the web. But, I always thought things were scattered all over the place, even though there are new sites appearing every day. My question was, which ones are worth checking out? Which ones are good enough? Is it worth my time to explore and click through to the site? I always figured that a friend's recommendation is a really powerful thing, and wanted to make that process much more efficient. Tim Sae Koo: Right now, we are probably going to use an affiliate model, which means that whenever someone clicks through to a purchase or something like that, we would be able to revenue share that. It's similar to Pinterest, and what their product does with Skimlinks. We'll use a similar process. Moving forward, it might also entail inserting sponsored, relevant ads into what you've collected in your collections. How our product works, is people curate and collect the sites they are recommending to friends, and create personal collections or profiles. Relating that back to the revenue model, we'll be inserting or embedding relevant ads based on what you've collected and curated. 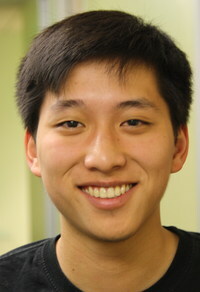 Tim Sae Koo: I just graduated from USC in December of 2011, with a business entrepreneurship degree. What is interesting about this, is I came up with this idea from my entrepreneurship class. I tested it out there at USC, and researched it, and really liked the idea. It kept sticking with me, and decided to pursue it farther, and have been doing it ever since. Where are you in terms of product? Tim Sae Koo: Right now, the product is in private beta. As long as you have a Facebook friend on our application, you will be able to get in. The reason behind that, is we didn't want to just be another system or application which you didn't know anybody or see any immediate value. The reason is, we work with your peers and close friends to help you discover the web together through them. If you have a friend in the system, you're automatically in, if no you can email admin@hypemarks.com for an invite. What's the biggest thing you've learned so far as an entrepreneur? Tim Sae Koo: As a first time entrepreneur, I've had a fair share of failures along the way. I was just blogging about this, but overall, I think to be an entrepreneur, it's a matter of trying and persevering through all the obstacles and roadblocks that come your way. I'm very humbled and surprised about how far we have gone within a couple of months of starting developing our product. I say, start young and start now, for anyone reading this, because right now is the perfect time to get into technology startups. The younger you are, the faster you can fail. Tim Sae Koo: The main big thing we're focusing on in order to continue pursuing this as a venture or product business. We're hoping to raise a round of financing, built the product, and it's now a matter of pitching it and building user traction, to solidify a seed round.